Both our villas can accommodate large groups for that special day, but Bann Chang Thai is especially idyllic for weddings due to its elegant sala which is centrally located on the wide open space of the upper terrace that overlooks the lush tropical surroundings — the perfect place to take those special vows. We can arrange the wedding ourselves or we can hire a professional wedding planner to ensure an unforgettable experience. Whether you are planning on having a casual wedding or an extravagant one, we can arrange services such as a celebrant, caterers, professional photographers, and florists. 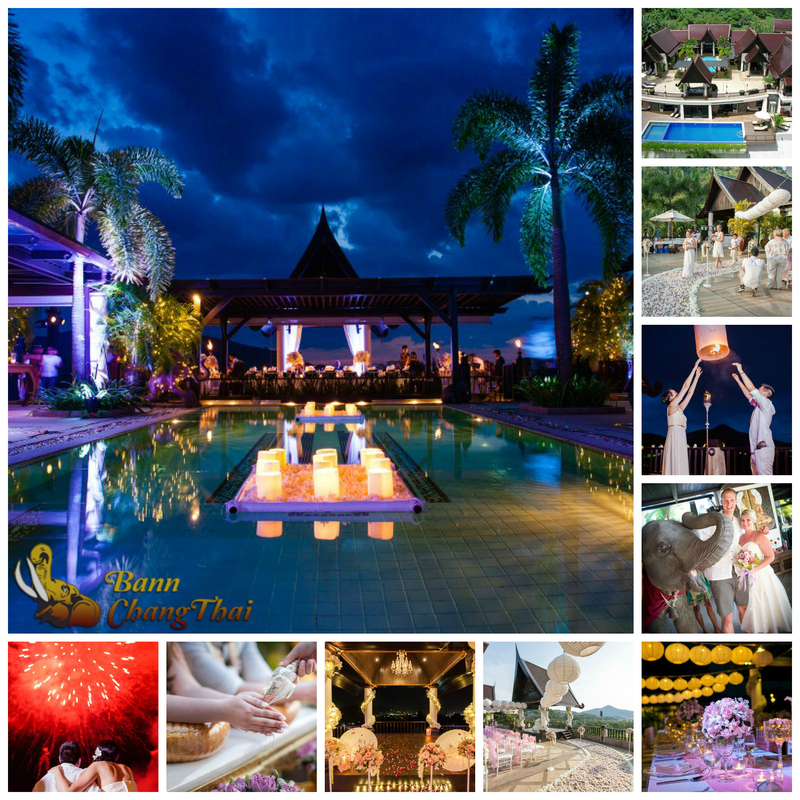 Other services that can be arranged to ensure that you have a fantastic evening include entertainment options such as fireworks, traditional Thai dancers, fire-twirlers, baby elephant, cabaret shows, fire (wish) lanterns, DJ, etc. Furthermore, both our villas comes with a professionally trained service staff to cater to your every need. Please contact us now so we can start planning your perfect wedding day ASAP! To view a presentation video and photo collages of previous weddings click here. "What can I say - this place is magical. There were 14 of us altogether staying in the villa for 5 nights and during this time we planned an intimate wedding for 22. The villa itself is stunning. The staff incredible. I just can't fault anything about this place - if you are hesitating to book, don't - you won't regret choosing this destination whether it be for a wedding or a family holiday, it's perfect!" "We had our wedding there and it was more than we could have ever imagined. Not only did we have a full staff, for our entire stay, but the planning of our wedding was also handled very efficiently and professionally and passionately. Everything was handled with great care and consideration. Top shelf. One of my favorite properties ever." "We celebrated our wedding with 45 guests and had such a blast! The whole day was perfectly organized and we always felt in good hands." "What an unforgettable experience! We were in Phuket for 7 days in November for our destination wedding and had our wedding reception at the Villa. It was perfect!" "20 out of 10 for everything, from the organization before our arrival, to the welcome we received, to the quality of the wedding preparation, to the food and service." "The location as a wedding venue was truly magical! A wedding at sunset, in the sala, with plenty of room for family and friends, cold drinks, warm hearts, amazing staff.....you're getting the picture...right!?" "Our daughter and her fiancée got married there on 12th March and we filled the 9 bedroom luxury villa with guests from Australia, NZ and the UK; simply the best venue we have stayed at in over 40 years." Click here to read our awesome reviews. If you've never savored authentic Thai cuisine made from the freshest organic ingredients, you're in for an epic culinary treat. Balance, detail, and variety are of paramount significance to Thai chefs. They not only pay attention to how a dish tastes; they are also concerned about how it looks, how it smells, and how it fits in with the rest of the meal. Thai chefs think of all parts of the meal as a whole — sum rap Thai (the way Thais eat) — is the term used for the unique components that make up a characteristically Thai meal. 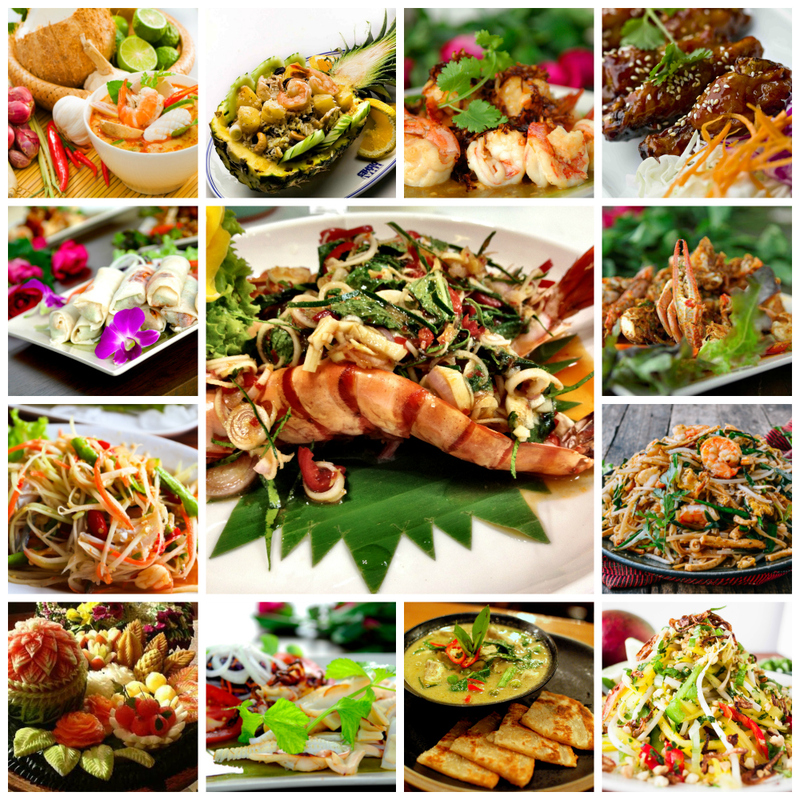 The succulent, aromatic flavors of Thai dishes are based on the harmonious mixture of numerous herbs and spices which include: garlic, galangal, cilantro, lemon grass, shallots, pepper, lime leaves, shrimp paste, fish sauce, and chilies; combined with the exotic sweetness of tropical fruits such as mangoes, papayas, and coconuts makes Thai cuisine a gastronomic delight. Both our villas come with a private chef that specializes in authentic Thai cuisine. And while it's true that our chefs are versatile enough to skillfully prepare western-style dishes, their expertise — and their hearts — lie in the culinary craft of their motherland. We can confidently state that the food we serve at the villas rivals any top restaurant on the island. And unlike restaurants, you'll never need to suffer long waits for your food or worry about the freshness of the ingredients. At the villa, you are always the guest of honor. So make sure you dine at the villa early on during your stay. You won't be disappointed and we're sure you'll be back for more! If you are vegetarian, vegan, or have any other special requests please let us know and we'll be more than happy to cater to your specific needs. 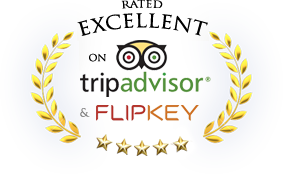 "The staff were fantastic and very accommodating! We also hosted a bbq for a big group of about 35 people, which the villa staff catered for. The food and atmosphere was amazing and all our guest commented on how fabulous everything was." "The food at the villa was delicious. Literally the best Thai food we had in Phuket. We would smell the food through the villa as they were cooking and would be salivating in anticipation!" "The food prepared by the on site chef is excellent and on par with any restaurants in the area." "Food was excellent — we were mostly eating at the villa because we probably had the best restaurant in all of Kamala beach." "The food was fantastic and probably the best we had eaten throughout our whole trip to Asia." "Food was amazing, so we never wanted to go into town to eat. Breakfast omelettes with a hint of chili, yummy Tom Yum and a host of fantastic Thai dishes." "One of the best things about this villa is the staff and the amazing food they prepared for us. Breakfast was great with a huge selection of bacon, eggs, pancakes, toast, fruit, cereal and juices. Dinner was even better with the authentic Thai buffet they did with the lovely table settings."  "The food was excellent, the staff were extremely helpful and welcoming; and the rooms were very comfortable." "The chef in this home rivals the best chefs in gourmet restaurants. She prepared five and six course dinners which we still talk and think about. The food was amazing, and the presentation was beautiful. Prior to our arrival at the home, we had planned dinners at a number of the great restaurants in the area, but one dinner at home demonstrated to us that for the best ambience, food and fun, staying home was the place to be." "Our breakfasts and the meals we ate in at the villa were sumptuous and delicious. Friendly Chef Noi is amazingly talented and it almost felt wrong to be going out of the villa to eat." "My family is still singing the praises of the wonderful Chef Noi and the magical culinary storm that she whipped up for us every day of our stay and the ever smiling Ta who was always on hand to cater to our every wish and whim." These are approximate rates. Please make a booking inquiry to receive a specific rate. Interested in staying at one of our villas? Great! Contact us with your details and we'll get back to you ASAP.